The forty-page book is illustrated with personal photos and memorabilia. It is formatted into twenty-three narratives organized in chronological order illustrating events and experiences in Ross’s life. Pages attractively interweave photos and text while prompts encourage readers to engage in in the story. Content area concepts are integrated throughout the story, including but not limited to science, technology, engineering, math, visual literacy, financial literacy, geography, flight, and the race to space. Gravity, for example, is a major theme illustrated within the content of the story. 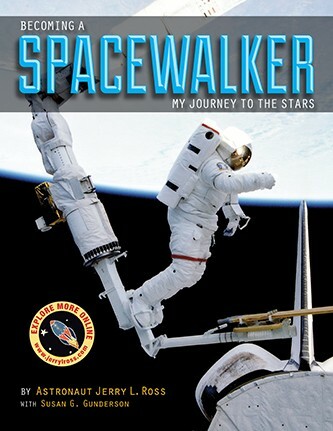 Online guides for teachers using the book in a classroom setting (third to fourth grade recommended) are linked to throughout.A map of the United States on the inside front cover invites children to follow the path of Ross’s journey from Crown Point, Indiana, to Kennedy Space Center. A timeline on the inside back cover compares and contrasts benchmark events in Ross’s life and career with important events in flight and space travel history. Further electronic materials are available at www.jerrylross.com. Susan G. Gunderson has been on the College of Education faculty at Purdue University in West Lafayette for nine years. She teaches literacy education courses to both undergraduate and graduate students. Gunderson holds two graduate degrees from Purdue—an MS and EdS in literacy and language education. In addition, Gunderson is a certified Reading Recovery Teacher Leader.